Maharaja Sawai Jai Singh II of Jaipur built Jantar Mantar in Jaipur between 1727 and 1734. Being a keen astronomer himself, Maharaja Jaisingh II has built five astronomical observatories across the West-Central India – in New Delhi, Jaipur, Varanasi, Madhura and Ujjain. The most elaborate one is situated at Jaipur city. The name Jantar Mantar translates to “Instruments for Calculation” and it consists of several instruments for the calculation of time and to ascertain the position of celestial bodies and sun. Jantar Mantar - a distant view. In Background Jaipur city palace. Jantar Mantar is located in the heart of the Jaipur city, at a walk-able distance from the Jaipur city palace and Hawa Mahal. Considering the fact that Jantar Mantar is an excellent example of masonry of astronomical instruments which also incorporate several architectural and instrumental innovations, UNESCO listed Jantar Mantar as a world heritage center. It is indeed an evidence of India’s advancements in the field of astronomy. There are eighteen main instruments including the largest sun dial in India – know as the "Samrat Yantra". Samrat Yantra is a 73 feet tall sun dial, which is used to calculate the local time at Jaipur. On the top of the Samrat Yantra, there is an observation deck, where the King Jai Singh II used to star gaze during the crisp and cloudless summer nights. Another instrument in Jantar Mantar is the "Jai Prakash" - Mirror of heavenly bodies. This is one of the most elaborate instruments built by Maharaja Jai Singh II, based on the astronomical concepts dating back to 300 BC. The Babylonian scientist and astronomer Berosos is the first one to build such a hemispherical sun dial. Jai Prakash is an advanced version of its earlier predecessors. Maharaja’s ingenuity is evident in designing thee Jai Prakash Yantra as two separate hemispheres and it is highly ergonomic. There are stairs provided for the observer to climb down into the instrument and move around freely to make accurate measurements. One interesting thing about Jantar Mantar is that, every instrument is preceded by an experimental piece. The experimental pieces are usually less complex and sophisticated compared to the actual instruments. 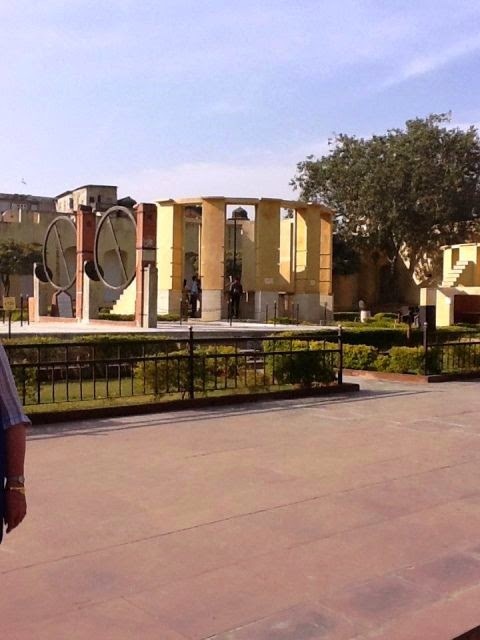 Jantar Mantar was used by the astronomy students as learning aids. The practical sessions and examinations related to the astronomy classes were conducted in this elaborate facility. It shows the practical orientation of the ancient Indian education. Another huge instrument in Jantar Mantar is the “Ram Yantra”. It is used to measure the altitude and azimuth of celestial objects, including the sun. Ram Yantra is considered to be an innovation by Raja Sawai Jai Singh as there is no similar instrument described in the Hindu or Islamic schools of astronomy. Krantivratta is a small instrument that us used for measuring the celestial latitude and celestial longitude of the objects in the sky. It can also be used to measure the solar sign of the sun during the day time. It consists of a central stone circle which is at a fixed angle parallel to the equator of the earth it is called the Nadivratta. There are two brass circles mounted on top of the Nadivratta which can be rotated to make the measurements. An elaborate instrument which is really interesting is the “Rasivalaya Yantra”. It is a set of twelve large instruments which represent one of the 12 zodiac signs. A particular Rasivalay instrument becomes operative when the zodiac that it represents approaches the meridian. It is only present in the Jaipur Jantar Mantar. There are also other instruments in the Jantar Mantar like the Laghu-samrat Yantra, Unnathamsa Yantra, Digamsa Yantra which are used for making various astronomical observations. Jantar Mantar is not only a great example of the scientific advancements but also the manifestation of the ancient India’s tradition of bringing beauty into everything they do. 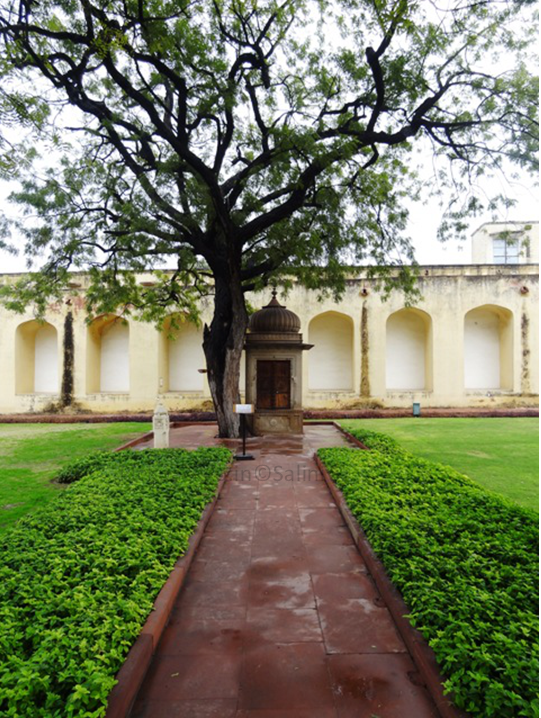 The Jantar Mantar is beautifully landscaped with a garden and red sand stoned paved walkways. One can also see that in India both religion and science went hand-in-hand, as there is a small temple within this scientific facility. It is the dream of any astronomy enthusiast to be able to visit and use these ancient instruments. Thanks ദുശ്ശാസ്സനന്‍, I felt the same when I was at Jantar Mantar. How our education system has deteriorated from highly practical oriented to mere memorizing the fact. When we travel through India we realize how culturally rich and diverse we are and it ignites the pride that you have in your country.